When I was a kid every summer we would tie-dye with my dad. We would use rubber bands to tie up the fabric and then dip it into dye. My sister and I loved it! We made tie-dye shirts, tie-dye bags and even tie-dye socks. As much as I love that dip-dye method, it is really messy and maybe a better outside summertime activity when the girls are a little older. So in the meantime I thought the Bee might be into tie-dying with sharpies. This is an easy fun experiment with super cool results. We started by getting out some sharpie markers (the more colors the better), some rubber bands, a plastic cup, rubbing alcohol and a syringe. You also need some kind of fabric to dye on. I had recently been on a baby clothes clean out so we used some old white onsies (you know the ones that are so stained they are beyond handing down.) I placed a plastic cup under the fabric and wrapped a rubber band around the mouth of the cup. The Bee then selected some sharpie markers and begin dotting. After some experimenting we found that dotting the fabric with the markers makes the coolest patterns and was the easiest for The Bee to do. Once she was finished dotting I filled a syringe with rubbing alchol and gave it to the Bee. She squirted the rubbing alcohol directly onto her drawing. The color immediately began spreading out, running into each other and blending. It really is pretty cool to watch. After making a bunch of circles we left the fabric to dry. I then cut out some circles and used fabric glue to glue them to a white shirt, The Bee already had, to cover up a little stain. Side note: It may have been better to sew them on but my sewing machine was still under a pile of junk at the time and the glue just seemed a lot easier and worked fine. 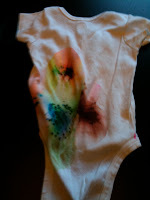 Cute baby, I like the way of making these tie dye shirts, when I was 14, on every weekend I made two tie dye shirts. Thanks for reminding me this activity.